Jaimie Alexander's Sif Breaks Into Agents of S.H.I.E.L.D. Agents of S.H.I.E.L.D. will host Marvel Studio's next crossover when Sif comes to Earth on a mission from Odin. WARNING: Minor Thor: The Dark World spoilers below. Perhaps the best part of following Marvel's cinematic universe, other than watching The Avengers smack Loki around, is seeing how every detail connects. Major and minor characters alike have been crossing franchises to tell an enormous story, with Jaimie Alexander's Sif providing the latest example. After gaining a strong following with her work on the Thor movies, Sif will soon appear on an episode of Agents of S.H.I.E.L.D. as she teams up with Marvel's spies to put down an Asgardian-level threat. "We always have our radar up for ways to tie our series into the Marvel films and bringing in an Asgardian really cements that connection," executive producer Jed Whedon explained. 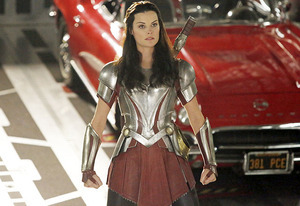 "Lady Sif comes here on a hunting mission - sent by Odin - to find her arch-enemy Lorelei and bring her back to Asgard. It throws our agents for a loop when they find themselves in a fight right alongside this powerful woman from Thor's world." If you've seen Thor: The Dark World, you're already aware that Loki is currently sitting on Asgard's throne, which raises some interesting questions of what he plans for Lorelei. On the set, however, everyone seems far more focused on the spectacle of a badass Asgardian warrior working with government agents. "Jaimie walked onto the set in full Lady Sif regalia just as she looks in the movies - from the huge, mile-high boots to the metal armor - and she towered over everyone," executive producer Maurissa Tancharoen said. "It was so striking and impressive, all we could do was stare. It was very cool!" Jaimie Alexander will appear in the Agents of S.H.I.E.L.D. episode "Yes Men" on March 11, 2014, which I suspect will also lay groundwork for the upcoming Thor 3.